Taste of T is in two days! From Allmilmo to Wood-Mode|ACK, the showrooms of the Architects & Designers Building will once again be buzzing with chefs from some of New York’s finest restaurants. 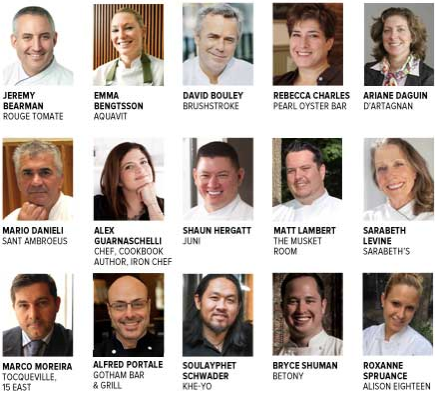 Among the participants will be world-class chefs including: Jeremy Bearman of Rouge Tomate; Franklin Becker of The Little Beet; Emma Bengtsson of Aquavit; David Bouley of Bouley; Rebecca Charles of Pearl Oyster Bar; Ariane Daguin of D’Artagnan; Mario Danieli of Sant’Ambroeus; Carmine DiGiovanni of Greenwich Project; Alex Guarnaschelli of Iron Chef America; Kerry Heffernan of TV’s Top Chef Masters; Shaun Hergatt of Juni; Matt Lambert of The Musket Room; Sarabeth Levin of Sarabeth’s; Bill McDaniel of The Red Cat; Marco Moreira of Tocqueville and 15 East; Alfred Portale of Gotham Bar & Grill; Raffaele Ronca of Rafele; Soulaphet “Phet” Schwader of Khe-Yo, Bryce Shuman of Betony; Roxanne Spruance of Alison Eighteen; Luke Venner of BLT Fish; and Isao Yamada of Brushstroke. 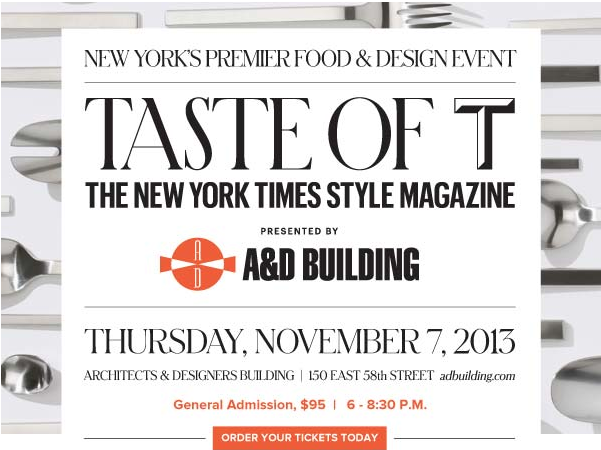 The evening’s activities are being presented in conjunction with T: The New York Times Style Magazine. A portion of the proceeds will be donated to God’s Love We Deliver, the non-profit organization committed to providing meals to people living with HIV/AIDS, cancer and other serious illnesses.